This installment of the Ultimate Relationship-series clocks in at 7 pages – 1 page front cover, 1 page editorial, 1 page how to use/SRD leaving us with 4 pages of content, so let’s take a look! All right, so this series provides romantic interests for the PCs as per the Ultimate Relationship-rules, so I’m assuming you’re familiar with them. If not, check out that pdf first (and/or my review for it). This time around, would be a lyrakien azata cleric, whose level 3 statblock (sans CR) is provided. Associated with luck, the lyrakien has recently lost her human companion – praying to her deity, she is guided towards the PCs. Gifts will not help securing deeper connection, but shared experiences of unique beauty will. The character dislikes cruel jokes and the like. Convincing her to join the party should not be too hard. There is a crisis point the GM can relatively freely adapt, basically a point of no return, where she may require convincing to stay, with starting attitudes and individual options to entice her to stay around. Advancement is covered briefly and there is a certain chance she may be doing other things on a given day before rank 4. Cohort status is unlocked at rank 7. As a lyrakien, she is obviously none too constant and romancing her is not too easy – on-again-off-again relationships can be expected until rank 10. Boon-wise, rank 7 grants either Knowledge (planes) or Perform (Comedy) as a class skills and also unlocks +1 to saves versus entangle/paralysis. Rank 10 doubles trait-bonuses shared and allows for 2/day immediate action 1-round the effects of freedom of movement, though the pdf fails to specify the CL – I assume her CL. Or is that supposed to be SU, since it only pertains the effects, not the spell per se? Not sure here. As far as rank-up requirements are concerned, they are much more diverse than one would think – while Perform (Comedy) is often used, so are different Knowledge-checks and even Sense Motive. Finally, Fly can be part of the deal. The romance, as a whole, is interesting and alternatives, once breakthroughs have been achieved, are provided – the romance, as a whole, feels believable. Editing and formatting are good, though e.g. when separating lines are used is a bit inconsistent – still nothing grievous to complain about. Layout adheres to a nice two-column full-color standard and the pdf has no bookmarks, but needs none at this length. The lyrakien has a nice full-color artwork, though fans of LG have seen it before. Mark Seifter’s first romance in the series is interesting, unique enough and believable. 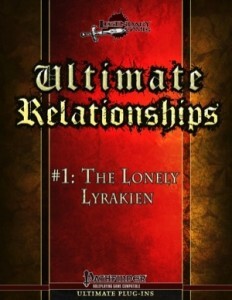 The lyrakien is pretty hard to romance, as she should be – and yes, I did enjoy reading this little pdf. At the same time, it’s a bit of a pity that one boon is a bit wonky in the details. Still, overall a solid, nice, inexpensive offering that adds a bit of romance to the game – my final verdict will clock in at 4.5 stars, rounded down to 4 for the purpose of this platform. You can get this nice romantic interest here on OBS and here on d20pfsrd.com’s shop!